The Sweetheart Celebration Ultimate Gift is a bright and beautiful way to capture their heart and create a romantic mood with each sweet offering! A dozen stems of assorted roses are brought together with lush greens and seated in a clear glass vase. 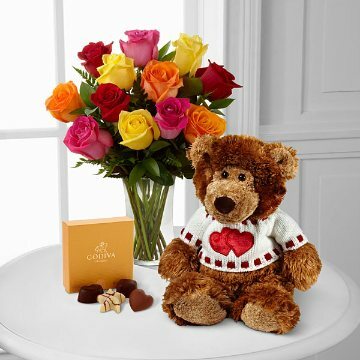 Accompanied by a 4-piece box of Godiva® chocolates, and a Build-A-Bear Workshop® Plush Bear wearing a red shirt that says "Hugs", this trio of gifts will be sure to make their day truly unforgettable.